With the weather being so changeable over the last few weeks, it was a nice change to see that the week-end weather looked fine for the second Bass comp. I think there were a few fishermen like myself, who did not weigh their Bass in because it was smaller than their previous Bass, forgetting there was still lots of points to play for, as this competition doubled up on points. 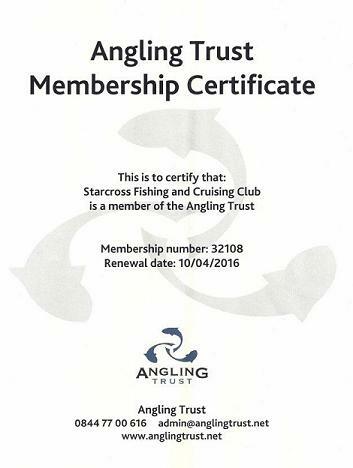 Well done to Josie, who is relitively new to the club and to fishing too. Her 2lb 12.8oz Bass, caught aboard Kevin's rib 'X-Pro', on the final Sunday of the competition, was the best overall. This has put her in second place on the Accumulator. Looking forward to seeing you all at the Fishing Meeting on Saturday 21st November. At this meeting we discuss our season, and how things might be improved for next year. Sorry it has taken me so long with the write up of the Conger Comp. There were four boats in total fishing for Conger Eels. It was a really was good day, with 18 Congers being caught in total. I am sure if more of our members had a go they would enjoy the fun of bringing an eel onboard. All you have to do after catching the Conger is weigh it in the net, then release it straight away. The fun starts when you try and hold it up by the trace to have a photo taken, as it can be a real laugh for the person taking the photograph. 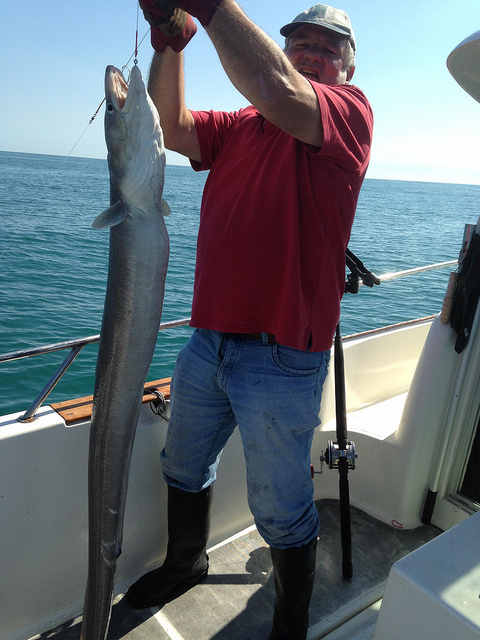 The biggest Conger of the day was a snake of 32lb caught by John Astill aboard his own boat J’s Pleasure. This event is at Newton Abbot Race Course on Saturday 26th September, starts 10:00am. New Bass Fishing Legislation applies. 1st July 2015 - 3 Bass per angler per day. 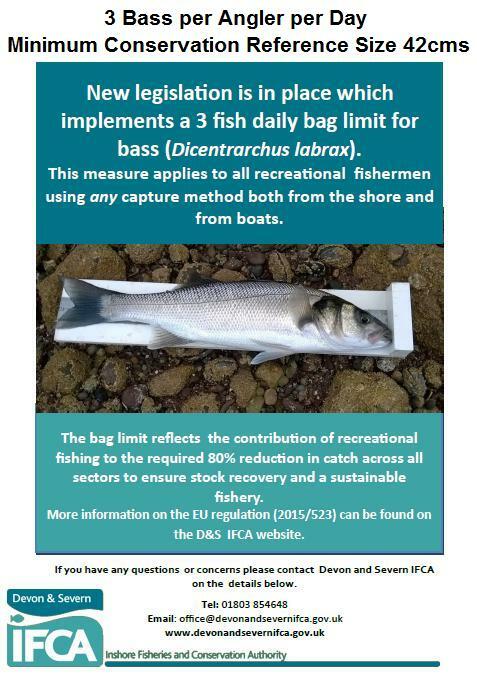 1st September 2015 - Bass MCRS, (Minimum Conservation Reference Size), of 42cms (16.5 inches), applies to all Bass retained. You might expect the Marine Management Organisation, or Inshore Fisheries Conservation Authority, or a liason of both, to enforce this legislation. River Exe Bass Nursery Area - No Bass Zone - all restrictions remain unchanged. No change regarding the Accumulator leader board for the club competition champion as none were weighed in. There were a few of us, myself included, fishing the Tardice Rough, and quite a few were at Straight Point, with a couple of others fishing the Budleigh area. But for all of our efforts no Bream were caught. 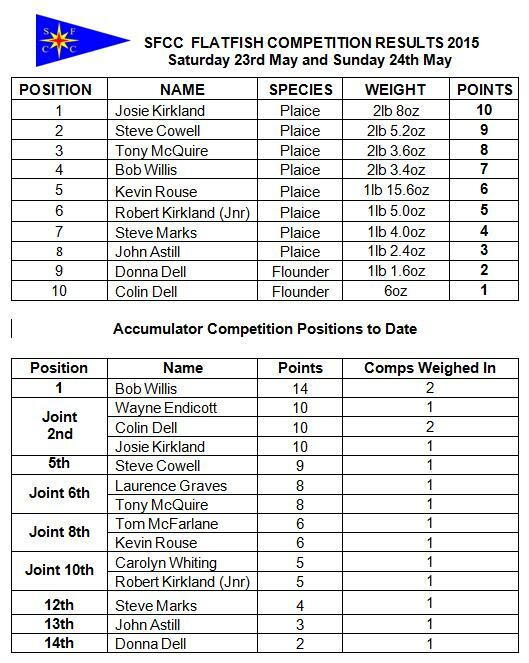 We still have a one Two Day Bass Competition to go, where there are points to move people up into the top six, and this is on 12th and 13th September, weather permitting. Even though the weather was not perfect on Saturday there were 13 members out fishing. Because of the conditions people chose to fish inside, but had little reward for their effort. On the Sunday most of those who fished on Saturday fished again, plus 11 more participants. Nearly all the Bass weighed in were caught on the Sunday, with Steve Mason aboard 'Mariner's Friend' catching the best Bass at 7lb 4.6oz. Steve also had a fine bag of 3 Bass weighing 17lb 5.2oz, which I believe is the biggest bag so far this season. It was nice to see Denise Stacey challenging the men for the top spot with her Bass of 4lb 4oz. She was fishing aboard 'Sun a Rise', and also also caught a Conger of 39lbs. This is all good practice for the Conger comp still to come. Well done Denise. Don't forget the Bream Comp on Saturday 29th and Sunday 30th August. 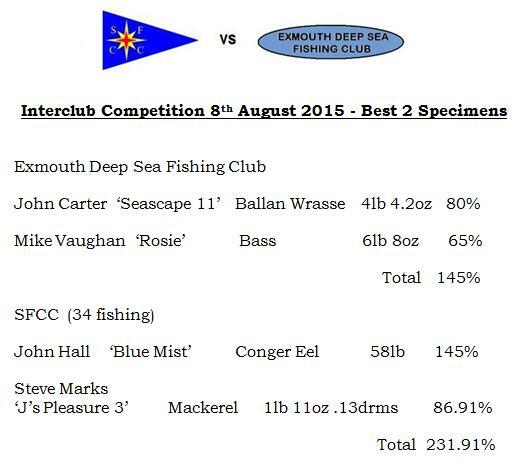 I may try and put the Conger Comp on 5th and 6th September. Not the best tides, but they are the smallest tides over a weekend, and we are quickly running out of time to get everything completed. The Conger Competition scheduled for Saturday 25th and Sunday 26th July has been postponed due to expected adverse weather. New dates are to be advised. It was nice to get the two competitions off on the scheduled date. Unfortunately I could not fish it because of other commitments i.e. my wedding anniversary, so I am unable to tell you with any certainty how many fished on how many boats. All I know is that at least 14 members fished and I should imagine many more over the two days. I would also like to thank those who weighed in. Kevin had a wonderful catch of 10 species, which is certainly the biggest bag I am aware of since I have been Fishing Secretary. Not far behind him was Steve Mason with a bag of 8 species, though unfortunately Steve did not weigh in his Mackerel separately. Josie had a catch of 5 species, and Mike Whiting also had 5 species, as did Bob Willis and Mark Fox. There were not many big Mackerel caught but Mark Fox's Mackerel of 13oz was first, followed by Bob Willis's Mackerel of 12oz. This puts Bob Willis in the lead on the Accumulator with 23 points. 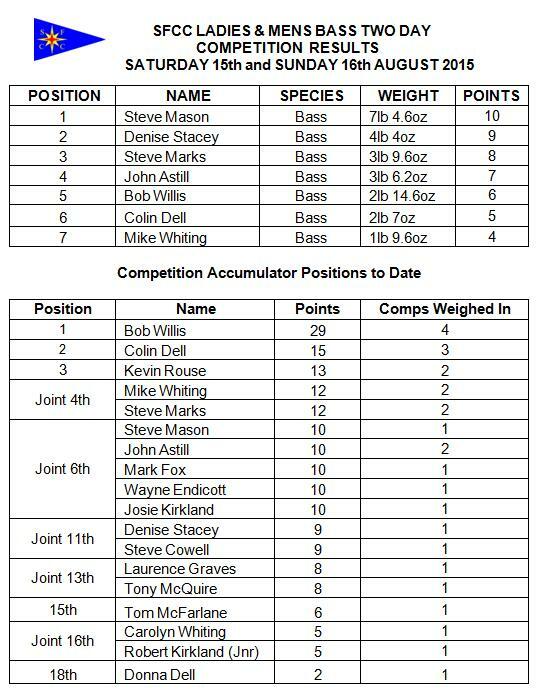 We only have three competitions left to decide who is the Accumulator Competition winner, two Bass competitions and one Bream, so anyone can win with 30 points up for grabs. This coming week-end Saturday 25th July and Sunday 26th July is the Conger Comp, weather permitting. Look forward to seeing you out on the water, and may all your fish be smaller than mine. 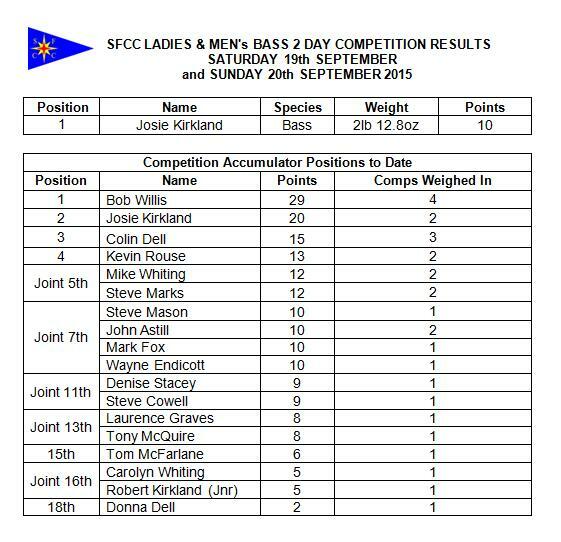 Well it was nice to get the Flatfish comp off on the second attempt, with Saturday being the best of the two days. Over the Saturday and Sunday we had around 22 members fishing, with some of them choosing to fish both days. It was good to see one of our lady members, Josie Kirkland, fishing aboard Kevin Rouse's boat X-Pro, take the honours with a fine Plaice of 2lb 8oz, and also Steve Cowell, Tony McQuire, and Bob Willis, all catching Plaice over 2lb too. On Sunday the weather was not quite so good, but we still had a good turnout. Most fished in the river because of the windy weather, though it was nice to see Dan Pike and family, 'Starshine', braving it out at the back of Straight Point. 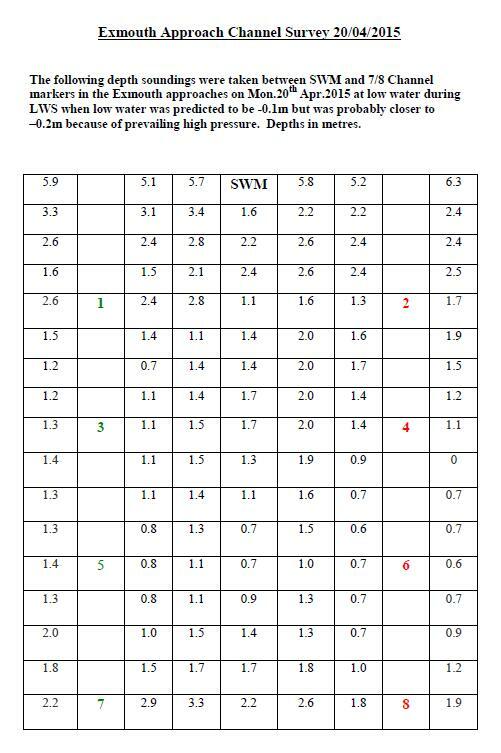 After the first two competitions there is very little to choose between those at the top of the Competition Accumulator. We have no competitions in June, the next being the Most Species on Saturday July 18th and Sunday July 19th, weather permitting. Please carry on weighing in your fish, and taking photographs. Looking forward to seeing you on the water, and keep safe everyone. 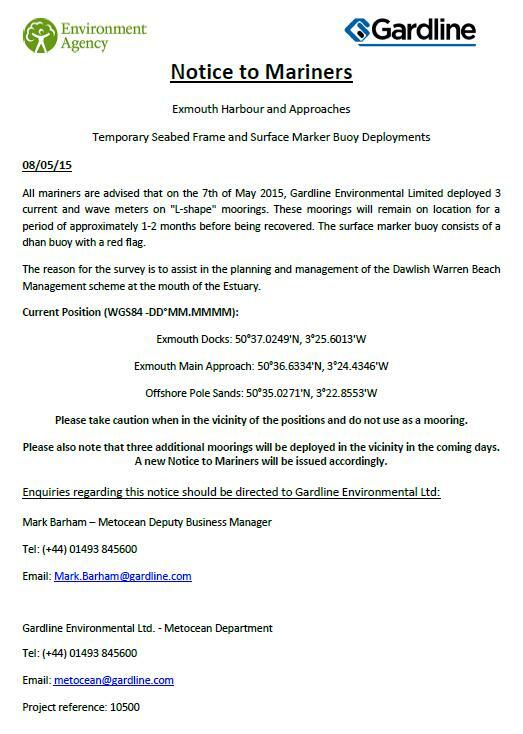 You might expect this new legislation to be enforced by Marine Management Organisation, or Inshore Fishing Conservation Authority, or in liason with each other. River Exe Bass Nursery Area - No Bass Zone - restrictions remain unchanged. 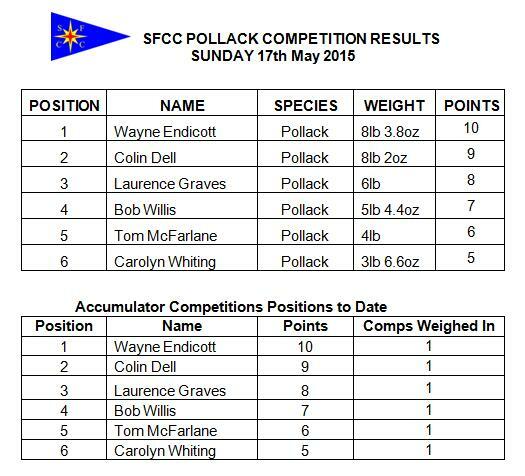 At long last we were able to get the Pollack comp off, after two postponements. It was not the best of week-ends, with Sunday being the best day giving a small window from early in the morning until 4o'clock. Even though it was not ideal we had eight boats and 18 members fishing. There were quite a few Bass and lots of Cod caught, the Cod being so plentiful that some of us, i.e. me and a few others, failed to catch a Pollack at all. But two of our members did manage to catch two fine specimens. Colin Dell caught a Pollack of 8lb 2oz, but the biggest Pollack was caught by Wayne Endicott, with a fish of 8lb 3.2oz. Both were caught aboard Colin's boat 'Dreamcatcher'. It is nice to see a new name at the top. 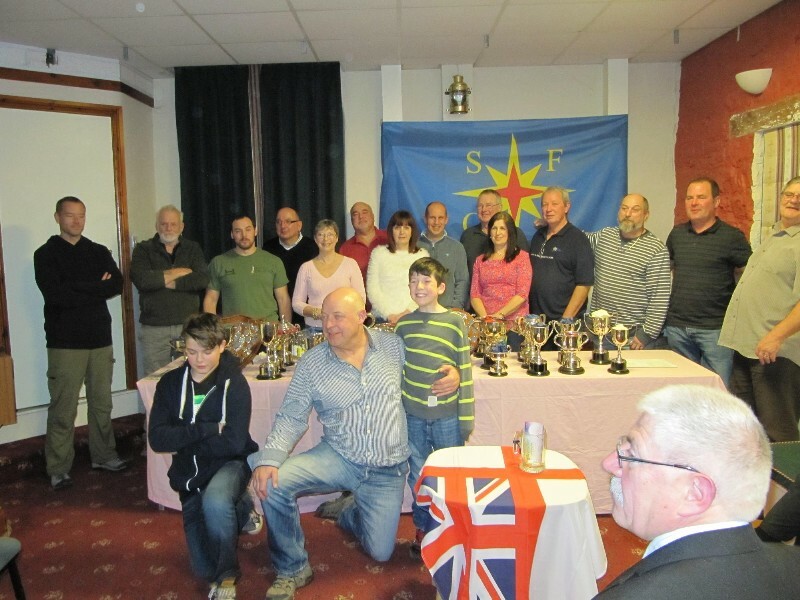 Just a reminder of the Flatfish Competition this week-end, Saturday 23rd and Sunday 24th weather permitting. 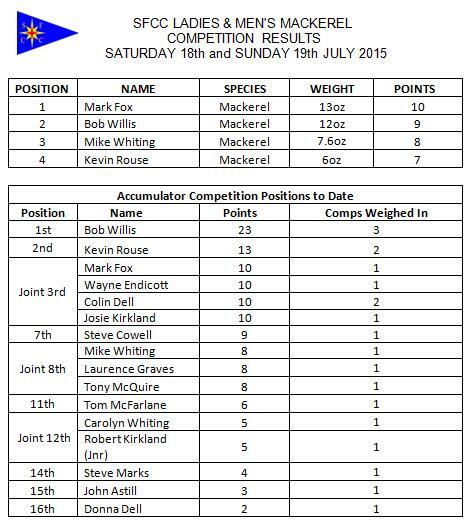 Also don't forget the Club Champion is calculated over 6 Comps, Pollack, Flatfish, Mackerel, 2 Bass Comps, and Bream. So you must weigh your biggest fish in, on all these competitions. Hope to see you all next week-end out on the water. We're paid up members, and respect their guidelines, just like we do the RYA. But our rules are our rules. The Pollack Competition is now scheduled for Saturday 16th and Sunday 17th May. 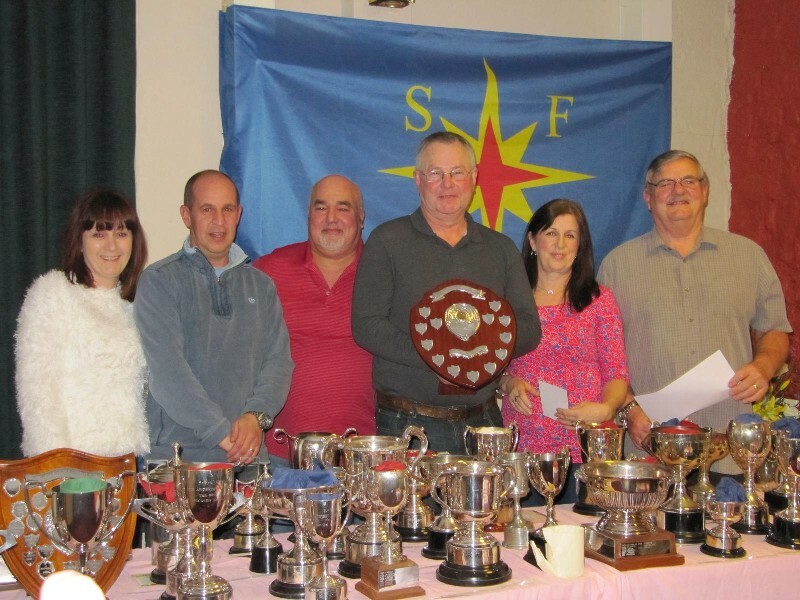 Flatfish Competition is posted for Saturday 23rd and Sunday 24th May. You may notice some buoyage in odd locations. The notice says more will follow shortly. Saturday 2nd and Sunday 3rd May. A recent survey regarding various recorded depths is displayed below. 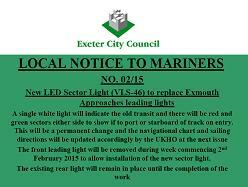 Exeter City Council have recently posted two Local Notices to Mariners, with both concerning Exe Estuary buoyage.